(W) Jason Aaron (A) Mahmud A. Asrar (CA) Chris Bachalo BEYOND THE SAVAGE BORDER! CONAN finds himself beyond the Black River, surrounded by the warlike PICTS! But the tribesmen may be the least of his worries if he cannot fight his way through the demonic beasts slithering around the forest! 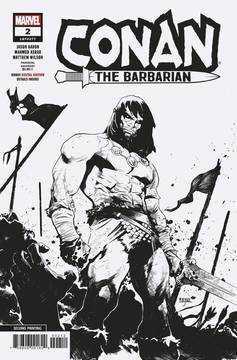 The epic return of the mighty Conan continues... Parental Advisory.